Our Memorial Day weekend was busy with multiple birthday celebrations and lots of outdoor activities including some last minute planting. Today I'm highlighting one of our favorite gardening books and have included images of our corn craft and a picture of our planting efforts this weekend. When my daughter was a toddler we joined the Children's Book of the Month Club. For us our membership provides a good way to beef up our home library with some classic books and also keeps us up-to-date by letting us know of new releases. While we don't order many books from the book club anymore, we have received some really great titles I probably wouldn't have heard of if not for our membership. The following gardening book is one of those titles. "In the dirt we'll dig a row, drop some seeds, and watch them grow. Dirt piles up; seeds go down. Water splashes around and around." 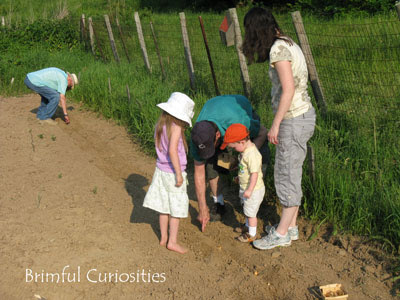 Every spring my kids enjoy helping plant the garden on my grandparents' farm. We grow several different plants in the garden. Week after week we go back and visit the plants and watch them grow. 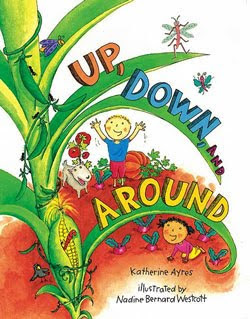 In between the visits we like to read Katherine Ayres' book, Up, Down, and Around. 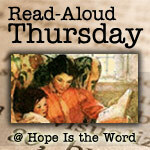 In the book, a little girl and boy help plant seeds in a garden and then watch the plants grow. The rhyming verses describe how plants grow and develop in the garden. Some grow up, others grow down and still others grow around and around. The colorful and humorous illustrations show the kids running around barefoot, while birds get tangled in the vines and bunnies and all kinds insects snack on the plants. This picture book makes gardening look like a ton of fun and encourages healthy eating by showing that consuming the bountiful harvest is one of the best parts of growing a garden. Perfect for toddlers and preschoolers, it gives a lighthearted insight into how plants grow and teaches kids about where their food comes from. The only thing we wonder about is how the characters manage to keep a completely weed free garden. There's not a weed in sight! The book includes the following plants: corn, carrots, cucumbers, peppers, potatoes, pumpkins, broccoli, beets, green beans, okra, onions and tomatoes. 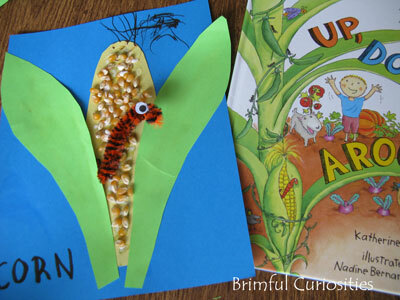 The cover of Up, Down, and Around shows a picture of a cornstalk with an ear of corn. I thought my toddler son would have fun crafting his own ear of corn using some popcorn kernels. I cut out the corn cob from a yellow piece of paper and also cut out two green leaves. He glued the leaves and corn onto a blue piece of paper. 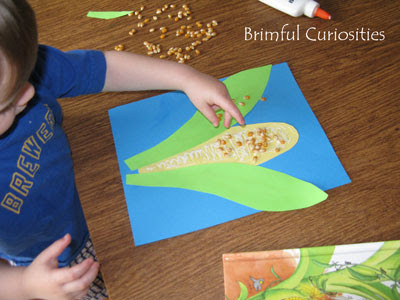 We squirted glue all over the corn cob and he scooped up handfuls of kernels and dumped them onto the paper. He loved this simple craft and decided that he wanted to add a worm like the one on the book cover. We made our worm out of a fuzzy pipe cleaner. In the garden, planting onions. That looks like a great book and fun craft! I enjoyed reading this. Have a wonderful day! What a wonderful book. Your son did a great job making his cob corn craft. We made one similiar one last year with uncooked beans. I like your idea with the kernels much better because the kids can work on fine motor skills with smaller objects like the kernels. Thanks for sharing! Looks like a lovely garden book! Must get one!!! Love the "real corn on the cob". Perfect! My 2 yrs old would probably want a fuzzy worm too! The corn cob turned out great. Love the idea of using popcorn kernels. We'll definitely be doing this one sometime. Oh, that turned out wonderful! I've never seen this book. I'll look for it this week. Thanks! Now that looks like fun! I was thinking about how much I am looking forward to summer corn, too. Now I am really hankering some! This is the second blog post I have read about this book. I have to request it from the library! I love your project. My kids have been asking for corn on the cob - one of my favorite things about summer! I love this book too. The corn with the worm is wonderful. The caterpillar is super cute! I am going to see if my library has this book as we are working on our first garden with our daughter. I love corn crafts - so fun! This looks fabulous--both the book and the craft (and the garden!). I love garden books.